Discussion in 'Bukkit Plugins' started by robxu9, Jul 23, 2012. NPCs can now grant quests to players! By using Citizens, you can now create NPCs and have them give quests! NPCs can give certain quests based on what the player knows, and also if the player has that NPC as a contact. Multiple storylines can be created through this system! Citizens2 is a step up from the original Citizens. Rewritten, and more intuitive, you can now set specifics to these NPCs, or even have non-human NPCs - let a Zombie, Cat, or any other mob give quests as well! Create an NPC. Note the NPC ID. Use /mqnpc toggle NPCID to let the NPC give quests. recommend: [0,3,4] NPC IDs of the NPCs that the NPC will recommend when it has no more quests. You can download snapshots of this from jci.lincomlinux.org. Please note that MineQuest-Citizens follows development builds. crispythemighty, Echobob and cloned like this. This is a plugin to Citizens2 (Beta) or Citizens (Release)? I know it's the same team but both are still available. Just need a clarification. how do u get that gui to open up? no matter what command i seem to try it does not appear, and to be clear we should have citizens2,minequest, and minquest-citizens? Well the gui requires Spout as well as the three you mentioned. - How do I create other types of npc's like mobs etc. - How do players get the quest and accept it? When i left click it says:" I don't know you. " 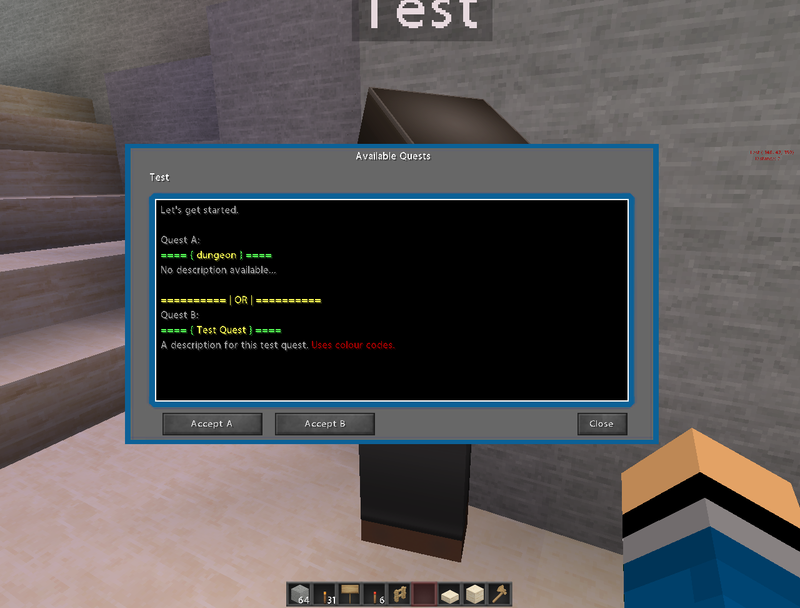 You should activate them with /mqnpc, then go ahead and check plugins/MineQuest/npcs and modify their yaml file. You should assign them either through commands or through quests - I think through quests it's NPCAssignEvent - I'd have to check. So in the yaml file for an npc I put in the: "quests: [questnamehere]"
What about the: "recommend: [ ]"? I just need to know how I make it show quests instead of I don't know you. And there is a contacts tab but how do I add a contact, does that have something to do with him saying I don't know you? Recommend does nothing right now. As for the contacts, you can add one with the /mqnpc menu. In the near future, players will be able to remotely call active contacts by doing /contacts call <npcname> - making life much easier. 13.09 16:36:22 [Server] SEVERE java.lang.NumberFormatException: For input string: ""
13.09 16:36:19 [Server] WARNING Can't keep up! Did the system time change, or is the server overloaded? 13.09 16:36:15 [Server] INFO [MineQuest] [Quest] Loaded Help4. 13.09 16:36:15 [Server] INFO [MineQuest] [Quest] Loaded Gate. 13.09 16:36:15 [Server] INFO [Citizens] Metrics started. 13.09 16:36:15 [Server] INFO [Citizens] Loaded 1 NPCs (1 spawned). 13.09 16:36:14 [Server] Startup Done (7.534s)! For help, type "help" or "?" 13.09 16:36:14 [Server] INFO [Denizen] Loaded WALK Command successfully! 13.09 16:36:14 [Server] INFO [Denizen] Loaded CAST Command successfully! 13.09 16:36:14 [Server] INFO [Denizen] Loaded HEAL Command successfully! 13.09 16:36:14 [Server] INFO [Denizen] Loaded HARM Command successfully! 13.09 16:36:14 [Server] INFO [Denizen] Loaded FEED Command successfully! 13.09 16:36:14 [Server] INFO [Denizen] Loaded CANCELTASK Command successfully! 13.09 16:36:14 [Server] INFO [Denizen] Loaded RUNTASK Command successfully! 13.09 16:36:14 [Server] INFO [Denizen] Loaded IF Command successfully! 13.09 16:36:14 [Server] INFO [Denizen] Loaded RANDOM Command successfully! 13.09 16:36:14 [Server] INFO [Denizen] Loaded HOLD Command successfully! 13.09 16:36:14 [Server] INFO [Denizen] OK! All scripts loaded! Can you tell me why am i getting this error? Can you give me the whole server.log from this session? It's not telling me enough information. Also paste it to pastebin or something. I added an option to toggle assignments off. Check npc.properties. How do i get the lastest development build?